Image courtesy of Library of Congress This 1848 print illustrated the death of Representative John Quincy Adams, who was surrounded by friends and foes alike. On this date, Representative and former President John Quincy Adams of Massachusetts suffered a fatal stroke on the House Floor. During a debate on whether to refer a resolution to the Committee on Military Affairs, Representative Adams voted in the negative. A short time later he collapsed at his desk. Representative Washington Hunt of New York interrupted the debate to bring attention to the ailing Adams. Members moved the 80-year-old former President to the Rotunda for fresher air and then relocated him to the Speaker's Room (the present day Lindy Claiborne Boggs Congressional Women’s Reading Room). Adams mustered the strength to thank the Officers of the House for their service. He then lapsed into a coma and died two days later. 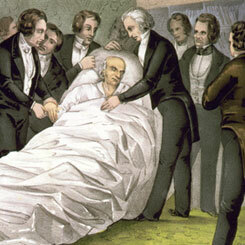 A funeral to celebrate the life of the great sage took place on February 26, 1848, in the House Chamber. Attended by political friends and foes, everyone sang the praises of Adams. Until arrangements could be made to move his remains to the family burial grounds in Quincy, Massachusetts, his body was laid to rest in Congressional Cemetery. A cenotaph marker remains in the cemetery to honor the former President.